Fake news: A screenshot of an article on Akhbor.com about the strange tale of Alisher Alikhonov. A new name has been added to the list of exiled victims of political repression in Tajikistan: Alisher Alikhonov. There is just one problem. Alikhonov does not appear to exist. It is not known if Alikhonov was the brainchild of a prankster with too much time on their hands, a media critic trying to show up the gullibility of the region’s press or a mischievous government-affiliated troll. Either way, his brief existence has highlighted the pitfalls of reporting on an increasingly closed country where policy is made capriciously and arbitrarily. 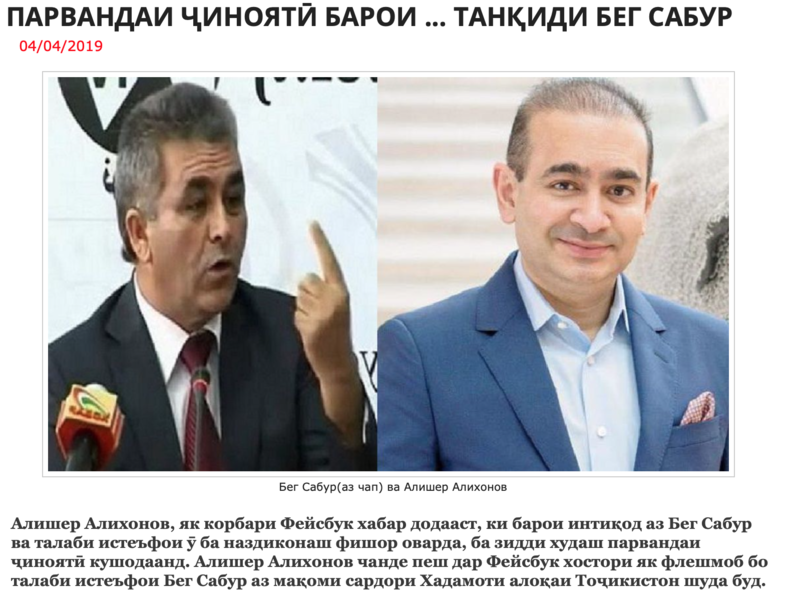 Last week, on April 4, a Facebook user going by the name Alisher Alikhonov wrote that police in Tajikistan were filing criminal charges against him after he had called for the firing of the notorious head of the country’s telecoms regulator. This Alikhonov claimed that the Interior Ministry had visited his home in Tajikistan and intimidated his elderly parents. Police supposedly accused Alikhonov of being a member of the banned Islamic Renaissance Party, or IRPT. Criticism directed at the head of the telecommunications service, Beg Sabur, also feels topical. Government plans to drastically hike the price of internet connections and telephone calls has sparked an unusually intense level of anger, especially among social media users. So the idea that Alikhonov could have been targeted for simply speaking out about Sabur fell on fertile ground. His plight was eagerly discussed among Tajik social media users. And then the story was picked up by outlets such as Akhbor, Ozodagon and Ferghana, which focus on Tajikistan and the rest of Central Asia. Explicitly opposition-linked websites likewise ran with the story. RFE/RL’s Tajik service, Radio Ozodi, had previously quoted Alikhonov in a March 12 article in his would-be capacity as a social media user speaking out against the price rises. Vaisiddin Odinayev, a Europe-based blogger, was intrigued by the case and thought he would also do his bit to help Alikhonov. But after some digging, he found that something was off. “When I started trying to figure out what had happened, I discovered that Alikhonov’s page was only registered on March 7. And yet the media represented him as an active blogger. Also, the photo on his profile page was that of Indian jeweler billionaire Nirav Modi, who was arrested in London [on fraud charges],” Odinayev told Eurasianet. And then, the Alikhonov account just disappeared altogether. As it turned out, there was never an Alisher Alikhonov. Police in Tajikistan deny charges were filed against any such person. Odinayev believes this fraud proved especially effective because people in Tajikistan have become so disillusioned and ready to believe in malicious and illogical acts by the government. “It’s getting worse and worse, and for that we have the country’s current leadership to thank. People have stopped being shocked by absurd decisions, and it just seemed to them that this was the latest such case,” Odinayev said. The region is no stranger to these kinds of fakes. In December 2011, several outlets were fooled by reports of the suicide in Uzbekistan of a young woman who had supposedly been violently interrogated for days by police. According to the initial account of events, the woman, who was identified as a 32-year-old called Gulsumoy Abdujalilova, had come to the attention of the authorities for her association with the foreign-based opposition group People’s Movement of Uzbekistan. She too was the figment of somebody’s imagination. In its mea culpa on the story, RFE/RL, which fell for the hoax, outlined a series of hypotheses that could as usefully be applied to the Alisher Alikhonov case. One possible scenario could be that the fraudulent account is the handiwork of security services seeking to undermine the credibility of activists documenting the decline of rule of law in Tajikistan. Attempts in future to raise the alarm about instances of abuse may well be greeted by dismissiveness from a government well-used to describing its detractors among the opposition and rights groups as hoodlums and lying troublemakers in the pay of shady outside forces. The Alikhonov case could bolster their argument. Although such episodes are embarrassing for the outlets that fall for them — and Eurasianet did also spend some time looking into Alisher Alikhonov before deciding against running a piece about him — they also serve a useful lesson about the dangers of reporting in a region where real fake news abounds.